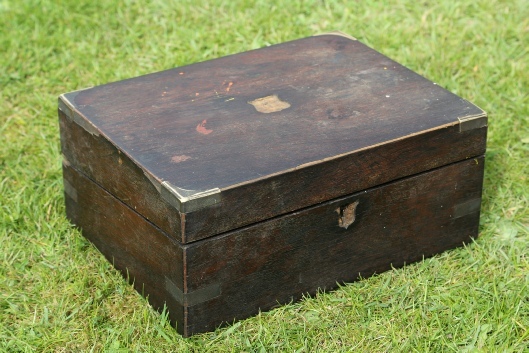 This wooden Writing Box is believed to be the ‘correspondence facilities’ referred to earlier, from King Edward VIII’s 1936 Buick. 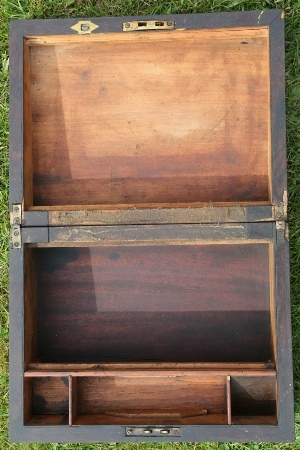 The box can be described as country made with mahogany veneers and brass corners suggestive of a travelling box. The trays, top emblem and lock plate are missing. John Pavelin remembers the house ‘Dunrovin in Little Wakering Road, being home to George Ladbrook, chauffeur to King Edward VIII, since it was a short distance from Baldwins Farm. He also remembers, as a boy, seeing the old Buick visit Baldwins Farm and on rare occasions it was garaged up in a barn at Dam Farm, near the south end of Kimberley Road. Obviously, George Ladbrook had driven the car back to his home town Barling at various times and this was somewhere secure to keep it. Pendril Bentall’s grandfather, Arthur, was a local magistrate and a member of the Home Guard at the time. He was a good friend of Albert Johnson who farmed Glebe Farm and Ruckins Farm. Albert was the captain of the Home Guard and Arthur Pendril gave him the old writing box from the old barn at Dam Farm which apparently came from the old Buick. The box, containing some taps and dies, was later discovered in a workshop, known once as Johnson’s Potato Shed, adjacent to the house which used to be called ‘Butcova’. After Albert ceased farming at Glebe Farm, he sold some farming equipment and the contents of the workshop, which included the writing box to Bill Pavelin’s father. The house, ‘Butcova’, stood in the grounds of the present ‘Barling Lodge’ care home in Little Wakering Road, which before that was known as Magnolia House. Dam Farm was demolished in about 1967 and replaced by The Evergreens. 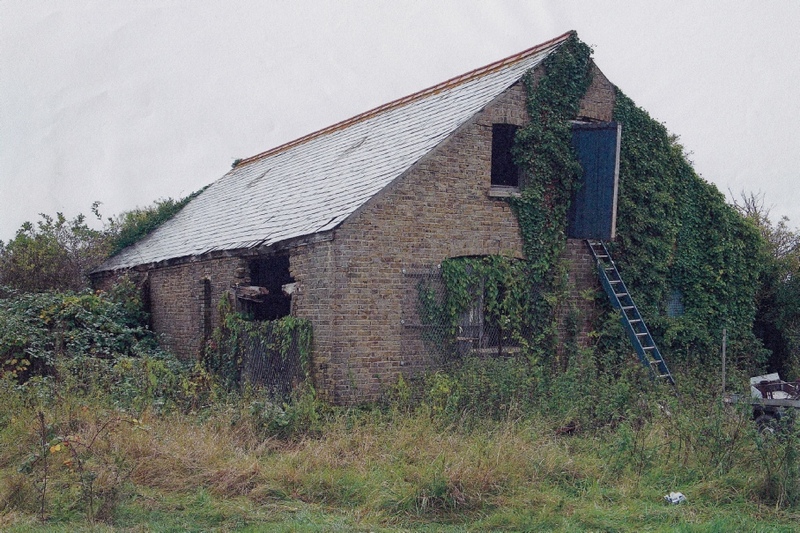 The old barn exists today (April 2016) but is fenced off and is part of the land currently being considered for planning permission for the build of 3 new detached houses. The barn will probably be knocked down but the above picture, taken by Bill Pavelin, shows how it looked just a few years ago. Olive Cooper remembers her cousin, Teddy Horner who is almost 90 years old, telling her that he used to help George Ladbrook wash the old Buick for 6d, each time he brought it to Barling.